Posted on September 26, 2016 at 1:59 am. When keno first advanced from a pub game to an online casino game, we were wowed by the technology and digital accessibility, but as technology rapidly expands, online keno has become just the tip of the iceberg. In a ground-breaking move, Gamblit Gaming has just unveiled a partnership with Phosphor Games to bring the virtual reality shooter style video game, The Brookhaven Experiment, into land based casinos. The collaboration intends to entice younger players who prefer video games to table games or pokie machines, and essentially breed a new generation of real money gamblers. 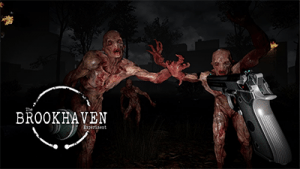 The Brookhaven Experiment is a VR survival shooter game where players use weapons and tools to defeat evil monsters in a bid to stop the end of the world from happening. It’s become an incredibly popular game compatible for use with the HTC Vive, with over 50 million views online, and will no doubt be successful in attracting younger players to a bricks and mortar casino. By tapping into the casino market, The Brookhaven Experiment will allow players to place real money wagers on things like whether or not they think they’ll survive the next hit of zombie attackers. Gamblit is a Californian company that’s leading the tech industry when it comes to interactive gaming combined with real money gambling. Their creations enable a wide range of video games to accommodate cash wagers, both online and offline. While Gambit’s catalogue doesn’t yet include any keno variants, we’re excited by the prospect of what they might eventually come up with. Gamblit’s new virtual reality gaming experiences are scheduled to launch in land based casinos in 2017. New to online gambling? Give keno a try at one of our top rated casinos to see how simple it can be to place real money bets on the Internet. We recommend G’day Casino where new players can claim an unlimited matched deposit welcome bonus to enjoy a range of real money keno games, including live dealer keno. But, what about this? supplose you wrote a catchier title? coming to land-based casinos iss kinda boring.